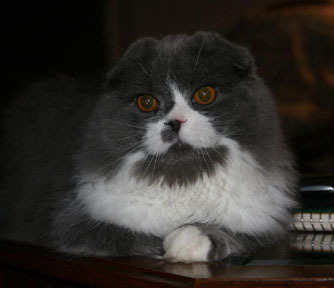 What is a Scottish Fold? 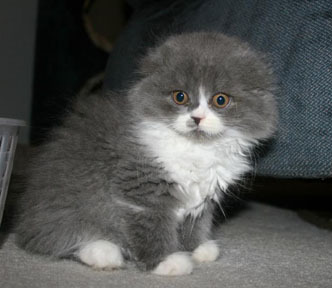 Milt got both his registered name and his nickname from Milton Hershey, the founder of Hershey Chocolates. Can you see the shape of a Hershey Kiss on his face? 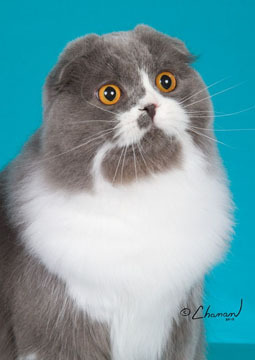 Milt is a blue mackeral tabby and white, long-hair, folded-ear boy. He loves the showhall. Noises and judges don't seem to bother him at all! He even loved getting his pictures taken. 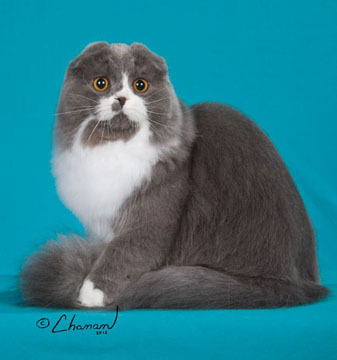 Milton is now a Grand Champion, which he obtained at the Ann Arbor, MI show on May 12, 2012. Congratulations to our boy!